Last night was the premiere of the final Harry Potter movie and we had our tickets purchased last week. I realized yesterday afternoon that I needed something to wear to the harry potter premiere. So I got some cheap gold fabric, maroon paint, and some gray knit, and got to work! I wasn't the only one who had the bright idea of dressing up last night. There were of course Harrys, Rons, Hermiones, a Luna Lovegood, and even a Voldemort! There were also a few scantily clad girls who seemed to think that a naughty school girl's halloween costume passed as Harry Potter wear. Not so much. Boyfriend is the real Harry Potter fan. He's the reason I got into the series at all. We were 11 when the first movie came out, the same age as all the characters (we're young'ens I know), so we got to grow up with them. Bittersweet to see it all end. love it! 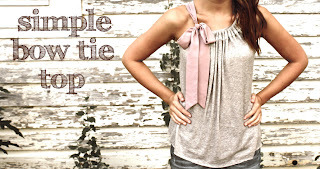 I'm thinking I'll make one of these tops! and I hope to see the movie soon... it's harder when you need to find a babysitter. haha super cute!! im sooo excited to see harry potter! im such a geek! haha. i love how you changed out the bow! i LOVE interchangeable things! I love it! The movie theater is too far away and I've turned into an old Mom who can't stay awake long enough to go to a midnight movie, but I'm a HP geek too. LOVED every book and have reread them again and again. When my babies were little, I read the books to them while I fed them. They didn't know the difference, but I did! Your shirt looks great and so perfect for the premiere! I grew up with it as well, so of course, like you, I made a shirt for the finale (: I love yours! That is such a great idea. The movie was awesome! I had to wait until tonight to see it. I can't stay up that late anymore. Perfect idea! I wonder if I can pull off wearing this when I go see it next week or if that'd be awkward? ha! Cute BF girl ;-) And I love love love your top! I really have to try it out at some point. Super cute! I just came across your blog via Pinterest and I'm in love! I totally need to make the skirt from your tutorial soon! This is so AWESOME! 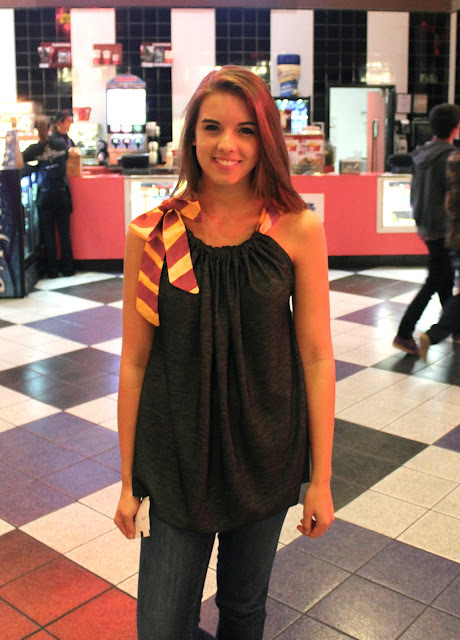 I loved the regular bow shirt and I love HP so this to me is amazing! You can be a super fan and stylish at the same time! love it! And those photos of you two are great! I haven't seen the movie yet, I'm going to wait a bit and then go see it when the theatre isn't so crowded, but it's killing me to wait!